The Palazzo is a well designed, new hotel offering guests comfortable accommodation in a peaceful location. With shops, bars and a restaurant inside the complex you won't have to venture further than the pool. We stayed here for 14 nights between the end of May and early June 2017. The hotel itself was nice, clean and did everything we needed. Food was great, pool nice and clean and big. Rooms were well equipped and the bed was comfortable. We did hear of some other people having minor issues but our stay was brilliant. The staff are amazing. We had three different events where they really wanted to do what they could to ensure we were happy. Sunny Beach is one of those resorts where service is not always there due to it being a cheap place. Trust me this place excels. It's not too far from the airport and the coach ride was bearable. We went self catering due to it being cheap to eat out but from the food at the hotel it looked great. I would have had no complaints if we went All inclusive etc. And one other important aspect, or serves good beer! Wouldn't hesitate to recommend to any couples of families. Self catering apartments are sufficient for a family of 3, there is a seperate bedroom and a double sofa bed incl air con. There is a nice roomy balcony to sit out on with a drink / food. The cooking facilities are very basic ie a small 2ring cooker, frying pan and a pot. There is also a microwave and a kettle but in all honesty you would be doing very little cooking anyway. The cleaners are very polite and do a thorough job each day and the towels are changed every few days. The bathroom has two very powerful showers (1 in the bath and another stand alone one)The floor area is a 'wet floor'so no probs with the floor getting soaked. Hotel staff at reception helpful in general. Position: 1st impressions you think that you are out in the middle of nowhere but unless you are in the usual 18-30 age group then it is ideal ie. 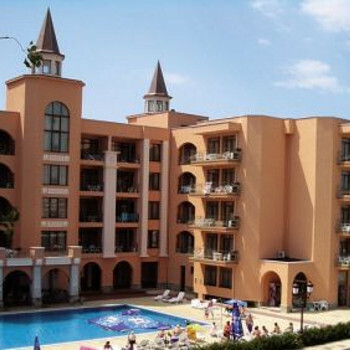 easy access to the centre and a nice walking distance to the nearby town of Nessebar. There is a bus stop approx 200 metres either side of the main road just up from the hotel and for 1 lev per person to anywhere in Sunny Beach or Nessebar it is ideal and the buses run every 15mins. There is also the 'wee train' which runs to and from the centre and also to Nessebar which is much more pleasent at only 3 levs pp. To cap it all you can easily get the nightlife yet have peace and quiet when you return to the hotel. The beach is about a 10min walk and you have to cross a very busy street but no big deal, the beach is a lot quieter than the one in the centre of the resort. Pallazzo 1 has a small 24hr supermarket attached to it which is handy and also hosts a Chinese restuarant, we never actually ate there so can't comment on the food. Pallazzo 2 hosts a Pizza cafe which is pretty average and quite pricy compared to a similar restuarant across the main road. The road down to the hotel is well lit ( contrary to a previous report)and there is a 24hr security presence around the hotel. There is no entertainment at the hotels but again this is no big deal as there are plenty of places to go within a 10-15min walk. Safety deposit boxes are available at 7 levs per day and if you want to hold the room on your departure day then it is 10 levs per hour, there is also a locked room available to store your cases in (no charge)on departure day. Staff were nice but it is a little off the beaten track. Quite dark approching the hotel from road at night if you were travelling by bus. Very near Coacoa Beach which was lovely and clean and quite. Apartments were spacious and we had a great balcony. The only downside were the shower facilities which were very clean but the floor always got wet no matter how careful you were which made it dangerous to get to toilet and sink for other occupants afterwards. The bus into Sunny Beach and Nessebar was excellent value at 1 lev each way to either place but finishes at midnight. The good points were apartments were very clean, it was quiet, and there were plenty seats at pool. Bad points were food not great. There was nothing at all for children to do other than the swimming pool, no guests in bar at night and you could not even play pool with children after 10.30. We stayed at the Palazzo in August 2006. It is very clean and also had a supermarket,which we found very handy. We had lunch most days there and found it adequate. About 100 metres from the hotel, you can get the small train into the centre of Sunny Beach or the Bus going to Nessebar. Hotel staff were pleasant but had very little English. Hi we stayed in the Palazzo it only opened the day we arrived. Hotel itself is lovely. But the pool is to close to the road for young children. It's a bit out from Sunny Beach with regular bus service but nothing much around the hotel. Going back this year but staying elsewhere.